Targeted toward kindergarten and elementary school students, we offer classes catering to learners of all skill levels, regardless of whether or not they have prior experience with English. There are two types of classes: Activity Classes and Eiken(English Language Proficiency Test) Classes. Activity classes are fun classes which frequently make use of art projects as a medium for learning. We also practice conversation on topics like weekly and monthly events, and learn practical skills to communicate effectively in English. Eiken class is a more serious class utilizing real questions from the English Language Proficiency Test to teach grammar, phrases, and increase vocabulary. We also help the students sign up for the periodic Eiken certification exams. 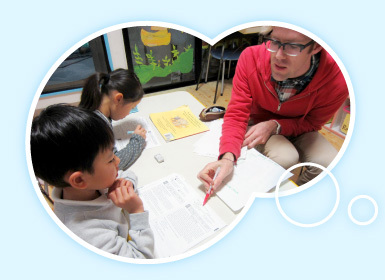 While there exists no objective rule by which to measure the improvement of a student's overall mastery of the English language, the stories of some of the students in our Eiken classes speak for themselves. 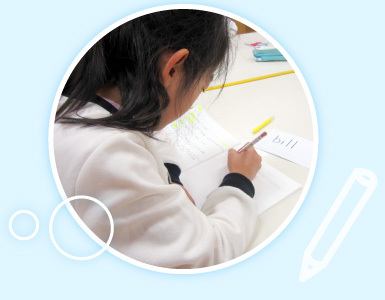 There have been several students who, having had no prior experience at an international school, joined our Eiken class at the beginning of their first year of elementary school. Within three and a half years were able to pass the pre-2 level English Language proficiency test. In another case, we had a first-year elementary student who won first prize in the KBS National Children's English Speech Contest.